featured | The Bloxwich Telegraph – incorporating The Bloxidge Tallygraph and Walsall North News. 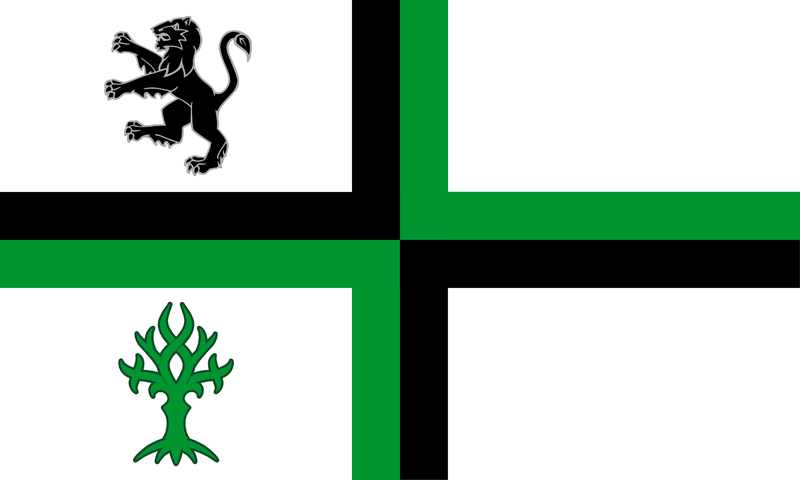 Founded 2006. Today marks forty years to the day since Her Majesty Queen Elizabeth II honoured the borough of Walsall with a very special Royal Visit to mark twenty-five years of her reign – her Silver Jubilee. Many of our readers may well remember that day. We certainly do – and we have exclusive pictures to prove it! The day of the visit, Wednesday 27th July 1977, had dawned grey and chilly, but there was to be nothing chilly about the reception which the Queen and the Duke of Edinburgh would receive; indeed their route into town was lined with people up to twelve deep, despite hours of waiting. The Royal motorcade arrived some twenty-five minutes behind schedule, and the crowds, made up of all ages from throughout the borough, had been there for up to seven hours. Despite this, there was an air of excited anticipation; even the local police on duty in Lichfield Street seemed to be enjoying the sense of occasion. Walsall policemen on duty for the occasion proudly show off their medals. I was reminded this past week of the centenary of the passing of a man who I usually think of in November, the month of remembrance, poppies, services and parades. A man who is probably not as well known as he should be, but of whom I have written several times in the past. 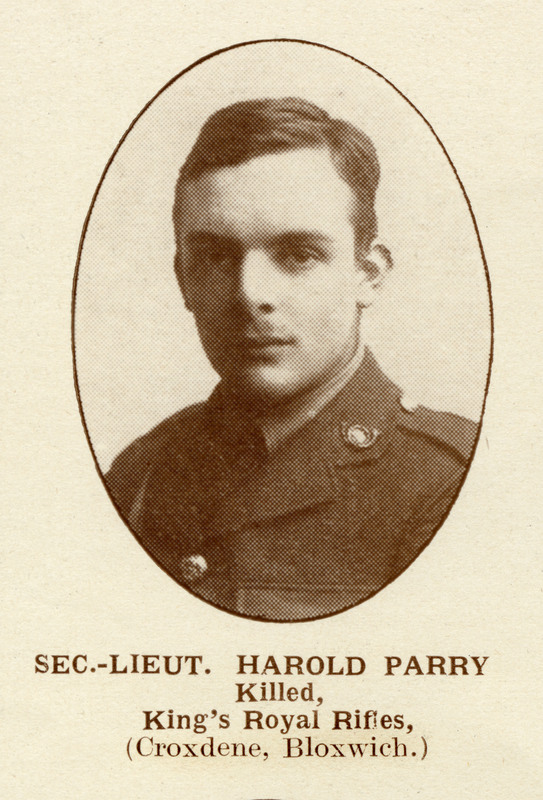 Harold Parry, Bloxwich’s own War Poet, who like so many others, made the ultimate sacrifice for king and country in the Great War of 1914-18. And that centenary is this Saturday, 6 May 2017. German dead at the sunken road in Guillemont during the battle of The Somme. 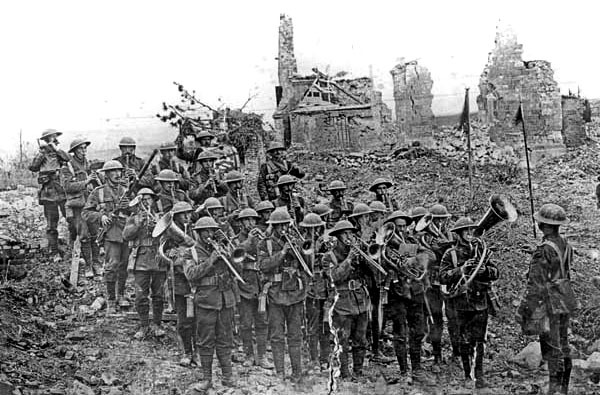 Band of the 5th Battalion South Staffordshire Regiment in the ruins at Ypres. Second Lieutenant Harold Parry, Walsall Pioneer, 19 May 1917. Instead of making his name as a soldier, in the decades following his death Harold Parry instead become known to posterity as a war poet. A posthumous volume of letters and poems compiled by G.P. Dennis ‘In Memoriam: Harold Parry’ was published, showing he was exceptionally gifted for such a young man. The letters show above all his extreme cheerfulness and loyalty, even in the face of danger and death. Some of his poems are also published in ‘Songs from the Heart of England’, an anthology of Walsall poetry edited by Alfred Moss with a foreword by Jerome K. Jerome. Such is the measure of the man. His good name and his words live after him, and he is not forgotten. Its twin, rather more careworn after a century, honours his name in Field Road Cemetery, Bloxwich. I usually go there to ponder on the life of a Bloxwich man and the folly of war in cold November. This time around, in the sunlit spring, I have visited that small, forgotten shrine of remembrance and placed flowers for the centenary of his passing. I placed them today. Perhaps others may do the same tomorrow, and think on the apt words of another poet, Mary Elizabeth Frye. Monument to Harold Parry at Field Rd Cemetery, Bloxwich. Ironically, although Harold Parry has a monument at Bloxwich, and there are a number of similar stones there, he is not listed on the Commonwealth War Graves Commission’s list for Bloxwich Cemetery, he is listed at Vlamertinghe. But there are also many men who are listed as buried here, via this link, and they are all worthy of remembrance. In 2016, young people and staff from the Walsall Academy in Lichfield Road, Bloxwich (site of the former T.P. Riley Comprehensive School) joined forces with Walsall Council’s Creative Development Team, video producers and digital media specialists Catcher Media, local writer and Bloxwich Telegraph editor Stuart Williams, Walsall Local History Centre, Walsall Council Regeneration and other local people on a very special Heritage Lottery-funded project to literally focus on the history and heritage of Bloxwich through the eyes, ears and voices of the school’s students, local people and other contributors and through the camera eye of Catcher Media. What if each Bloxwich building or street has a story to tell? And what if some of these stories are fascinating? Or scary? Or funny? And what if they make you think about Bloxwich in a new way? Re-discover it. So Walsall Academy students set out to find out about Bloxwich’s heritage, and to tell that story back to Bloxwich residents. They talked to celebrities, their own families, older people and historians. The Rediscover website and the film they made pools all of the information, photos, interviews and stories that came to light throughout the project. 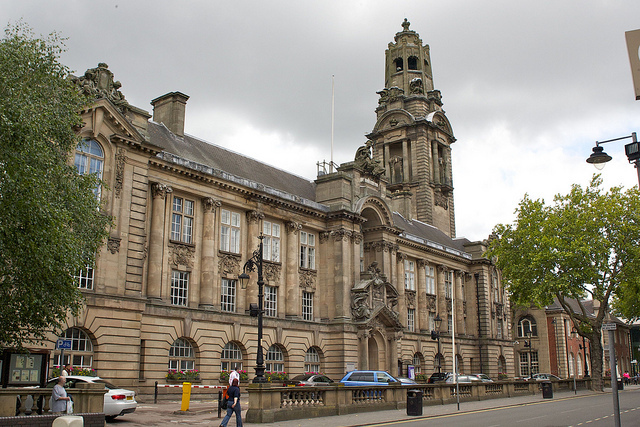 The project is also being followed up by the production and installation of a range of related public heritage art pieces set to be installed in Bloxwich centre later this year. Apart from information about the project and the main video content itself, there are also a number of pages which offer links to more resources, several video clips of extra interviews of local people and Bloxwich rock legend Noddy Holder of Slade fame, and several pages themed on local Bloxwich heritage topics, with historical information, covering everything from Bloxwich pubs and local myths to industry, churches, fairs – and the Bloxwich lion! Information is also provided about the planned heritage artworks, and credits and acknowledgements. 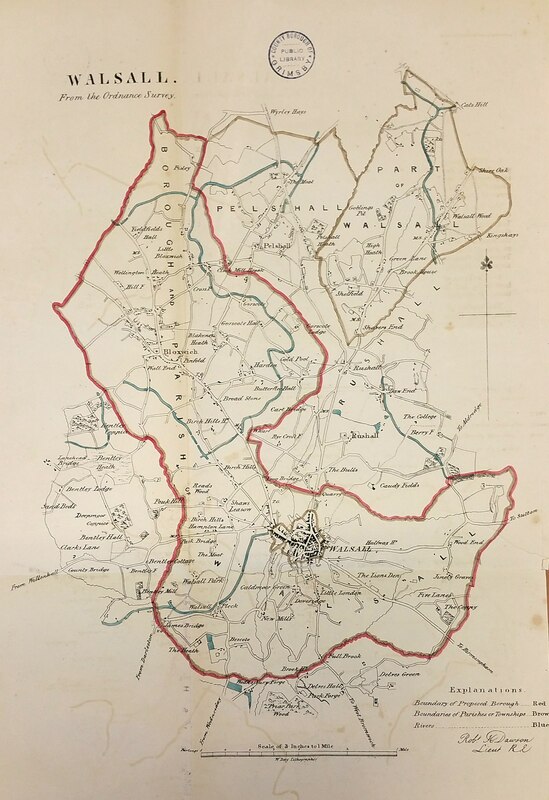 The Bloxwich Telegraph, whose editor Stuart Williams was commissioned to act as Historical Advisor to the project, is proud to announce its formal – and now digital – links with the project, the film and the resulting website. From time to time we will highlight aspects of the project from this site and and on our social media. To this end we have now installed a permanent direct link to Rediscover Bloxwich on our main site menu, and via clicking on the Rediscover logo in the right-hand column of every page. We hope you enjoy finding out about Bloxwich’s past, through Rediscover Bloxwich and via the pages of The Bloxwich Telegraph. For further information, please click on the following link or any of the others highlighted in this news item.